Around the world in one religion . . .
People of every nationality, race, ethnic group, and religious background around the world have declared their belief in the Bahá’í Faith. 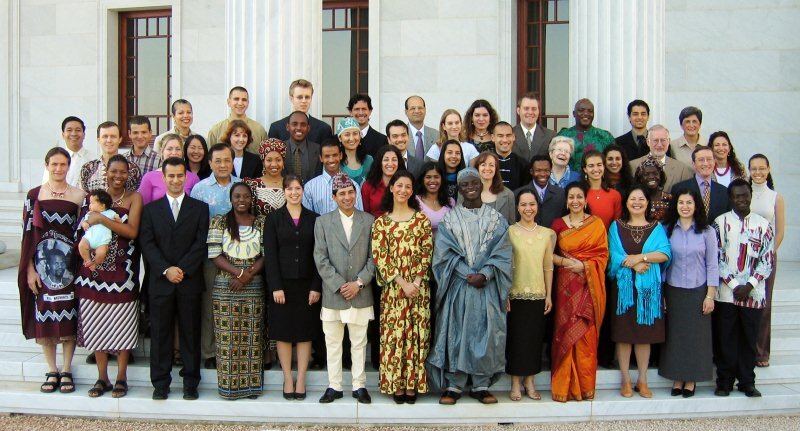 Shown here is a group of people from around the world who have volunteered to serve at the Bahá’í World Centre in Haifa, Israel. Reprinted by courtesy of Bahá’í International Community. The Bahá’í Faith is described as an independent, monotheistic religion. It is established in virtually every country of the world. Bahá’ís believe that the world’s major religions represent unfolding chapters in God’s teachings for humankind, and that the writings of Bahá’u’lláh represent God’s guidance for this age. Bahá’u’lláh’s central teaching is the unity of humanity under one God. ← Charity saved him from ill-feted Titanic voyage . . .